You will be guided by a UIMLA trail running guide. 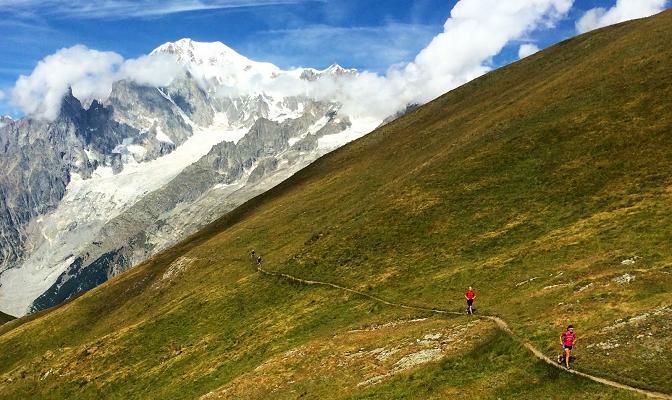 It doesn't matter if you ever plan to run the actual UTMB race, though some use the week as a detailed race recce. This is the enjoyable way to run it, in the daylight hours, where you can savour the views, and recover well after each day of running. Six days running makes it a comfy distance each day, not just for the uber fit! We plan to recce the route at a steady race pace, not pushing too hard, as we strive to enable you to complete the sections just within cut off times, with the minimum of impact on your body, to ensure that your physical recovery is as quick as possible. Six days of guided trail running, with fast-hiking the steep hills. Mon Run from Chamonix to the Les Contamines area, over Col de Voza, and up the old Roman road. Tue Ascend over the high passes of Col du Bonhomme and Col de la Croix du Bonhomme. Night in Les Mottets. Wed Run over the Col de la Seigne into Italy, then Arete Mont Favre, and descend to reach Courmayeur for the night. 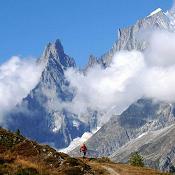 Thu Ascend to Bertone hut, then to Arnouva and over the Grand Col Ferret into Switzerland, to La Fouly. 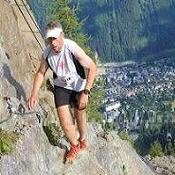 Fri Run the Swiss Val Ferret, then via Champex and cross the Bovine, to descent into Trient for the night. Sat Cross the Catogne, and via Vallorcine to Tete aux Vents, to finally reach Chamonix and the end of the recce! Inspirational 60 second video of last weeks trail runners completing the Ultra Trail du Mont Blanc recce, starting in #Chamonix, 170km long, with +10000m vertical. Standard Course Inclusions: 1) UIMLA guide for up to six days, 2) Chamonix course hosts for logistics & briefings, 3) Pre course information booklet, 4) Equipment discount voucher for our UK shop, 5) Two nights B&B accommodation in Chamonix (inc. bedding & towels), and 5 nights half board in mountain huts / lodges / gites, 6) Free 36 page technical Course Instruction Booklet, 7) Local logistics support throughout the week. Notes: We cap numbers, as this is an ultra-distance event, to maximise group safety and allow for more flexibility and a comfortable and managable group pace that suits everyone in the team. During the recce, we aim to run at the race cut off pace as an absolute maximum, for the comfort of everyone in the team. The group sizes for this trip are a minimum of 2 runners, and a maximum of 8 runners per guide.